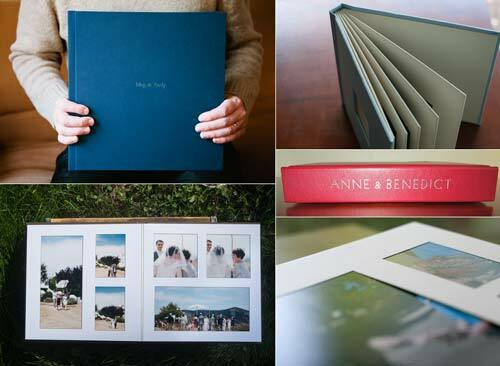 Matted Albums are the classic wedding album option, and have been around for at least a century; individual photo prints are enclosed in thick pages with matted openings, in heavy books bound with leather, faux leather, or silk. These are very substantial albums. In the contemporary style, photos are attached beneath a mat with linen texture with no edge hardware or border. It is more sleek than the traditional but still a very substantial presence. The pages and book spine are strongly squared, for a crisper, more modern feel. 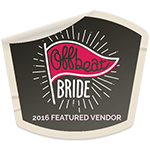 Turnaround is 5-8 weeks from design approval; a large (10×10) 20 page album (not including design) begins at $600. I offer two styles of contemporary matted albums: the Renaissance Ambiance and the Seldex Gallery. 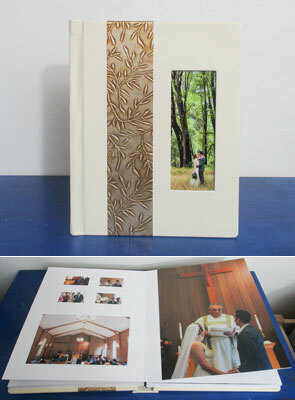 The Gallery tops out at 30 pages/75 images, but has more & thicker mat options and superior blind embossing on linen. The Ambiance goes up to 40 pages, has fewer mat options, and has spine imprinting. Enough people needed one or the other that it became easier to just officially offer both. If you like the style of matted albums, but not the weight or the price, I can create some of the same feeling in other books with particular design choices; just ask. Large (starting at 11×14/12×12 inches) contemporary style album that allows for edge-to-edge photos to mingle with the matted pages. Mats can be cut according to any design, not just a set of standard shapes and arrangements. Turnaround is 8-12 weeks from design approval; a 20 page album begins at $1300.